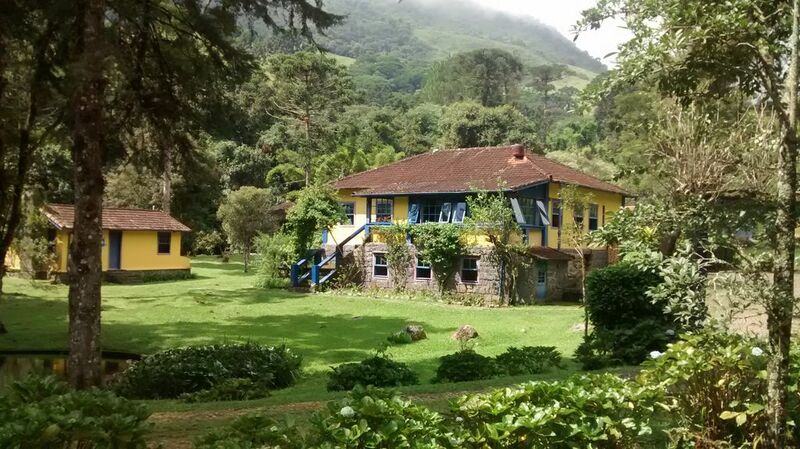 Enjoy true Brazilian hospitality at a family farm retreat, nestled in a lush mountain valley, hours from Rio. The centerpiece of this stunning rustic getaway, is a 100 year-old main farmhouse with 6 bedrooms, a lounging room with circular fireplace, and a dining room adjoining a wood-stove country kitchen where delicious regional meals are served. The house is surrounded by vast stretches of grassland and forests, crossed by a pure-water stream and natural swimming pool. There are three additional chalets with eight rooms; access to a bath house with sauna and showers, jacuzzi, and lounge with a bar. On the grounds, an outdoor barbecue and a large bamboo gazebo ideal for relaxation, meditation and games. Local mto bacana!! Atendimento na fazenda mto bom tb! Para quem gosta de sair um pouco do dia a dia e passar um momento em contato com a natureza, eu recomendo!! Me and my friends enjoyed a Wonderful weekend at this farm. Everybody got crazy about the place and the views. The staff were very kind and all the place was clean and organized. Also we could share a good breakfast together! I'm sure that I'll come back in the future, as well as everyone that went with me! Juan was very kind and took off all my doubts. We had nothing to complain! Quero agradecer pela maravilhosa estadia que eu e minha família tivemos nestes 4 dias. Conseguimos juntar 25 pessoas (entre adultos e crianças) que moram em 3 cidades diferentes numa casa na qual nos sentimos como na casa de nossos pais e avós. Além da belíssima paisagem com natureza preservada, rio transparentemente límpido, acomodações aconchegantes, confortáveis, com tudo o que necessitamos tem ainda um staff super eficiente representado pela Mª José, pela Odete e pelo Leandro, que preparam um delicioso café da manhã, limpam e cuidam da casa com perfeição e ainda nos ajudaram na preparação de almoços que nos deixaram com água na boca! Todos adoraram e já elegemos a Fazenda São João do Vale da Grama o local do nosso encontro anual daqui para a frente! Já é a 6 vez que nos hospedamos na fazenda, e sempre nos surpreende a estadia, o staff e a natureza.....a cada estação do ano, uma uma expectativa correspondida! Is located in the best preserved valley of V. de Mauá (1,5 km from the town,6,5 km from Maringa and 9 km from Maromba),and is easily accessible from Rio or Sao Paulo.Both hiking and/or horseback tours are available to surrounding areas with spectacular panoramic views, and to the beautiful waterfalls, where swimming is allowed.The farm,enhanced by its vast collection of exotic bamboo species, is the headquarters for EBIOBAMBU, a research and experimental center for the culture and use of bamboo.